2018 Banff Mountain Book Competition Nominee, Tabei’s and Rolfe’s Honouring High Places. When my friend Rick Wood was still working at Rocky Mountain Books, the mountain book publisher in British Columbia, he and I exchanged emails about some of their upcoming projects. The one he was most excited about he couldn’t talk about, at least not yet. He just said: just wait! Several months later what I was waiting for arrived in my mailbox. It was a significant new book for the publisher and the English language as a whole. 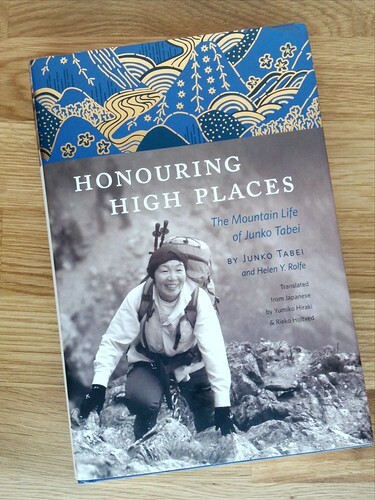 Helen Y. Rolfe worked with texts from Junko Tabei, whom Rolfe knew, to bring Honouring High Places: The Mountain Life of Junko Tabei to life. It was written by Junko Tabei and Helen Y. Rolfe and translated by Yumiko Hiraki and Rieko Holtved (Victoria, BC: Rocky Mountain Books 2017.) Although we all know that she was the first woman to reach the top of Mount Everest and the first woman to complete the seven summits (the Puncak Jaya or Messner version,) there was less context for the challenges she overcame to accomplish so many great climbs. What shined through Honouring High Places is Tabei’s spirit, which was extremely aware of herself and everything and everyone around her. And she wanted everyone to share in what she saw in the world, though she seemed to encourage it by urging her readers to go outside and explore new challenges for themselves. Tabei wrote about how her birth in Fukushima Prefecture, a rural community, first distinguished her among her urban classmates in the city, later in life. She had a country girl accent, which stood out. She was also the dreamer, yet conscious of everyone’s limited imagination: When her women’s mountaineering club was organizing an expedition to Mount Everest, Tabei writes: “A common response was: ‘Wow! Himalayas! I would love to go, even just to see Everest.’ Then, ‘But … I don’t have that much skill, or time, or money….,’ and so on. I found it difficult to hear people crush their dreams with the word ‘but,'” (Tabei 128.) In fact, her attitude of “I will go on” without any excuse or any “but” to offer was her hallmark. There was a disproportionate amount of chapters on the Everest expedition, for my taste. While it is what she is most known for, the other seven summits were much less encumbered with expedition and media politics; perhaps for that there really was more to tell; there certainly was more drama. Learning about her roots in the country, to trying to come to form in the big city, and navigating the mountaineering clubs hierarchy, was the most unique and enriching part of her story. Tabei’s and Rolfe’s work with Yumiko Hiraki and Rieko Holtved has since been nominated in two prestigious competitions: Banff Mountain Book Competition (literature-nonfiction category), and the Boardman Tasker Award for Mountain Literature. It’s a significant book that deserves a place on your bookshelf. Thanks again for stopping by. If you enjoyed this post, you might want to sign up for my email list with for special announcements and other updates and follow me on Twitter and Facebook.